PIVOT Dublin were delighted to have Deborah Cullinan, Chief Executive Officer of Yerba Buena Center for the Arts (YBCA) as Guest Curator of our blog in June 2016. At Yerba Buena Center for the Arts, we strive to be the creative home for civic action – the place where people from all walks of life can come together to help shape collective responses to urgent questions, heartbreaking realities, real possibilities. We believe in the creative capacity of our community. In response to these seemingly simple questions, we have received hundreds of ideas. They range from playful projects to practical interventions to tranquil moments; from back-of-the-napkin dreams to painstakingly designed concepts. Just by asking, we have been able to spur a movement in our city and bring a diversity of new people-powered ideas to life in the streets of San Francisco. Designed by Studio for Urban Projects (SUP), Outpost served as the anchor project for the Central Market district – a dense and contested neighborhood with little access to open space and other public amenities. SUP, also Design Captains for this District, envisioned Outpost as both installation and event venue proposing new ways of thinking about flexible infrastructure for community gathering, collaborative learning, and engagement in a neighborhood that has been underserved. Housed in a simple prefabricated structure inspired by the frame systems of the 1960s, Outpost piloted 72 hours of public programming during our 3-day festival. Designed to be easily made, adapted, and replicated, this inventive project provided a venue for planting workshops, wildlife tours, film screenings, bicycle pit stops while also offering places to play, eat, talk, and relax. Designed by Cheyenne Purrington and collaborators, The Tenderloin ExerTrail was designed to be an accessible outdoor exercise path that reclaimed wide sidewalks in order to encourage simple exercise, collaboration, and connection. The project was conceived for San Francisco’s Tenderloin district, home to more than 25,000 people, including over 4,000 youth. Many Tenderloin residents live in Single Resident Occupancy (SRO) hotels, in rooms that measure 6” by 8”, sharing common kitchen and bathroom facilities. These dense, urban living conditions limit access to public spaces for exercising, socializing, and getting fresh air and sunshine. Bench-Go-Round, designed by George Zisiadis, encouraged collaboration in public space. This inventive approach to public seating consists of opposite facing benches that can rotate 360 degrees. 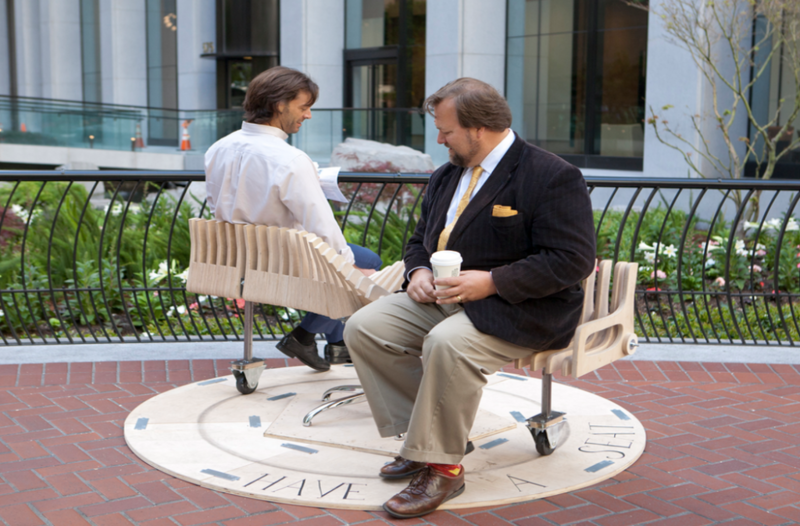 A merry-go-round for the street, this prototype encouraged playful encounters in San Francisco’s Financial District between strangers and passersby. Arena Play, designed by Gensler, brought an interactive new twist to San Francisco’s Embarcadero District. A six-sided ping pong table with responsive LED lighting and arena seating, this project drew constant crowds throughout the festival providing people with opportunities to connect, play, engage. Fog Plane played on San Francisco’s notorious microclimates. Using structure and fabric to create a simultaneously opaque and transparent experience, this evocative prototype uses the effect of fog on people’s experience of the city as inspiration. It was designed for the Civic Center where people in transit seek moments of respite and a sense of community. Though these are just a few of the fifty prototypes we featured in the 2015 Festival, all together this array of creative ideas illuminates the untapped capacity and resource in communities across the world. Stay tuned for reflections on the 2015 Festival, examples of prototyping projects taking off all over the world, and glimpses into our 2016 Festival.